I’ve actually been told multiple times that sure, my birds are cute, but people would NEVER own them. One person outright said these are her two least favourite species of birds! And I can completely understand that both my birds are kind of… not the most popular of bird choices, hehe. I thought I’d do a mini profile on the general species to give new bird owners, or would be Quaker/Caique owners a bit of an idea. Quakers are a small to medium sized parrot, larger than a cockatiel, and more stocky in build than a Green Cheek Conure. They come in many different colours, the two common being green and blue, and mine being a pallid green (cinnamon green). They have a long tail and beautiful blue flight feathers that are absolutely breath taking. First things first, if you live in the US, there are some states in which Quakers are illegal. They are considered an agricultural pest (although they don’t eat crops), and are able to live in urban areas quite easily. 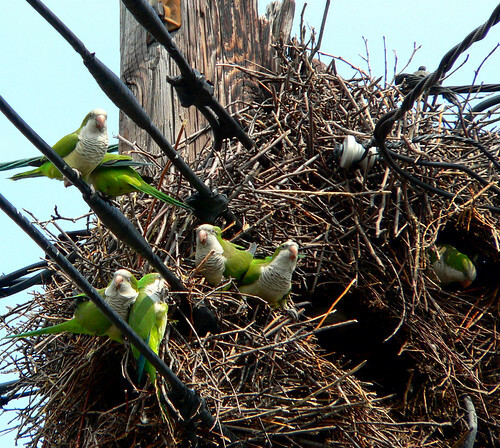 They are the only parrot that builds nests, and they usually build huge elaborate structures over telephone and power lines. I find if you buy a properly raised baby, and continue to care for it properly you will have a great pet, but these birds often end up in rescues due to aggression. Quakers are famous for being cage aggressive, meaning they will attack even their loved owner if they get near their cage. To avoid this, I would make sure you are ALWAYS in their cage when you first take them home, moving toys around, etc. They are also loud birds, and make noises that people find absolutely grating on the nerves. BUT, they are fun birds, always quizzical of the world around them. Some in captivity are known to build beautiful huge nests if allowed. Such as this guy. They are extremely cuddly birds, are are known to be great talkers. They are known to be fiercely devoted to their “one person”, so I would make sure to socialize your bird with other people to avoid unneeded aggression, and mating beahaviours. The name Quaker comes from a quaking action they do when begging for food. It is seriously the cutest thing in the world, and they are perhaps my favourite baby to hand feed. Oh and one more point. DIET is EXTREMELY important for Quakers. They are known to get fatty liver disease very easily, so a healthy diet of pellets, fruits and veggies are a MUST. So, personally, I love Quakers, I find them to be fun pets! But of course, they aren’t for everyone. I’d do lots of research before ever considering a Quaker.